767 KNX is without doubt one of the most important surviving 60s GT racing cars due to its history, originality and provenance. Unlike the rally cars which were more numerous and made of steel with alloy wings, the Works Competition cars were all alloy, highly tuned, specially prepared for circuit racing and only five were built. 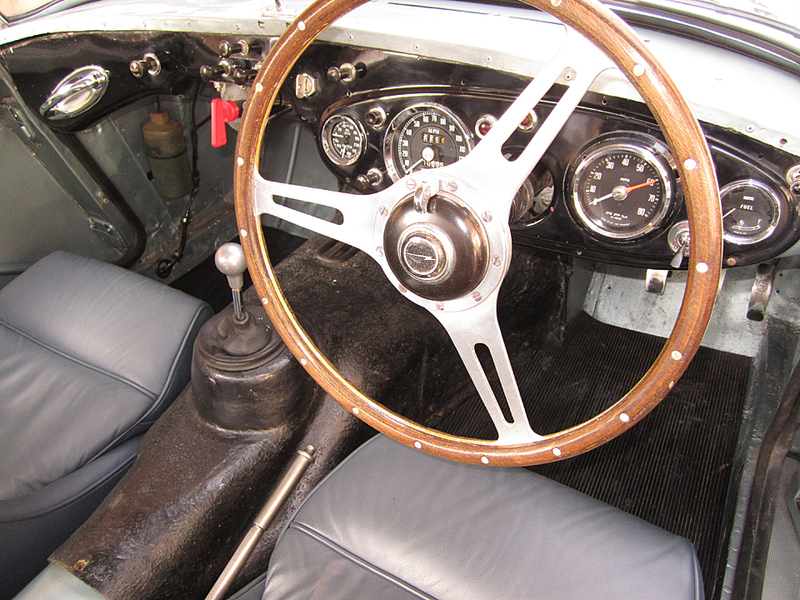 767 KNX was race prepared by the Warwick based Competition Department for the 1964 Sebring 12 Hour Race. Geoff Healey himself led the project to build the most extreme racing 3000 yet using a stiffened chassis and a thin gauge aluminium body combined with a lightweight fiberglass roof. 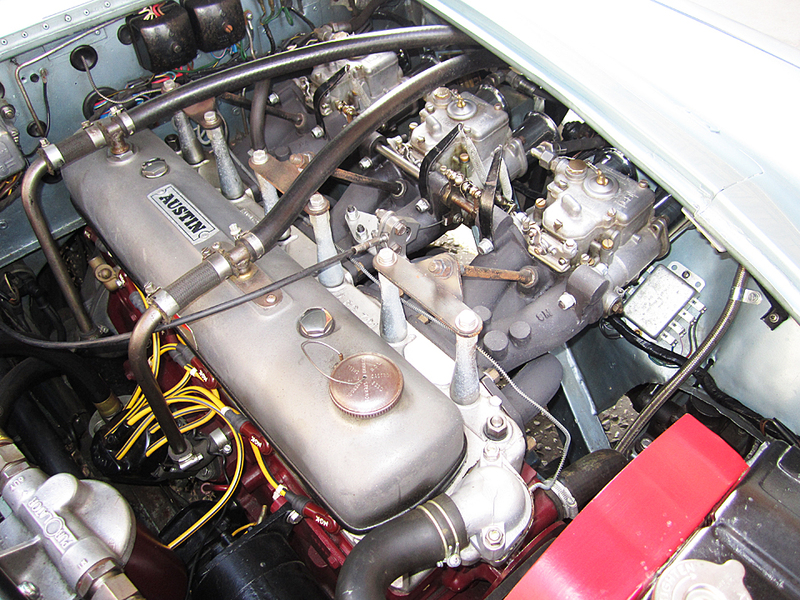 The engine was very highly tuned with hot cams, ported aluminium heads and triple 45DCOE Webers, with power feeding through a 4-speed close ratio racing gearbox (with overdrive) and a ZF limited-slip differential. 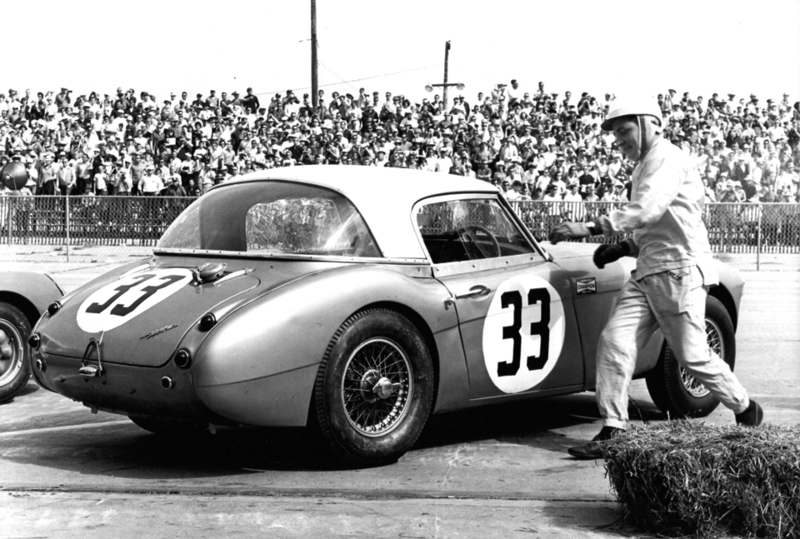 Meticulously prepared, Healey had done everything he could to prepare for battle against the Ferrari 250 GTOs in the USA. For the Sebring 12 Hours on 21st March 1964 the factory fielded just one car, 767 KNX, and he sent over his favourite driver Paddy Hopkirk to lead the team with Canadian Grant Clark as second driver. 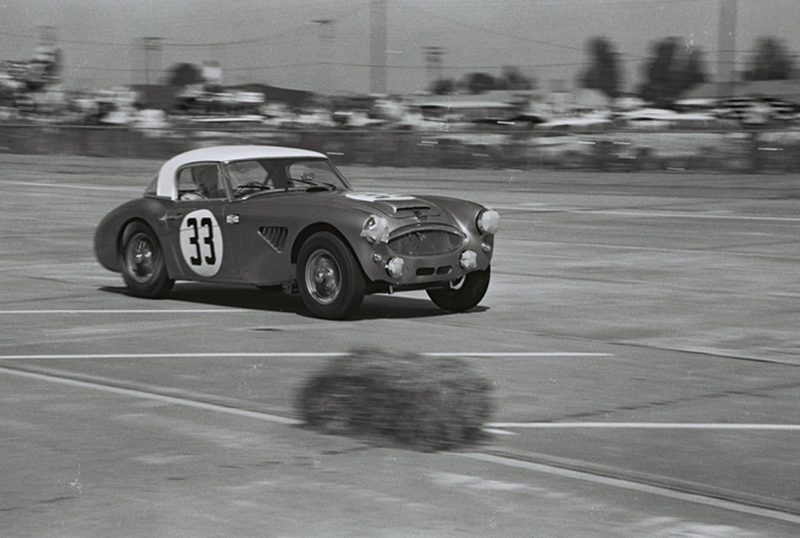 Hopkirk started the race as the only non-Ferrari in his class but he almost immediately hit trouble with a puncture. After his pit stop he completed over 40 laps at a searing pace before handing over to his Canadian teammate. Just minutes later whilst still trying to regain lost time, Clark lost control and ended the race on his roof. A disappointing end to a promising Works effort, 767 KNX was shipped back to England and the light damage sustained was easily repaired. Healey sold the car in August the same year to Yorkshire wool magnate Mr Henry R. Crowther, and a copy of the original Sales Invoice is in the history file. Crowther kept 767 KNX for a short time before Ted Worswick acquired it, an ownership period that would be as important for the car as its previous Works life. Worswick is regarded as one the main protagonists of the Big Healey movement, alongside characters like John Chatham, having owned, rallied and raced several ex-Works cars in period and throughout the following decades. In the true spirit of an English privateer, Worswick competed at the highest level on a shoestring budget. He entered the 1966 Targa Florio and drove 767 KNX down to Sicily himself. He shared 767 KNX with Alan Minshaw but failed to finish due to a back axle failure, forcing a repair at the side of the road before the long journey home. Worswick also entered the 1966 24 Hours of Le Mans but did not arrive for the race. 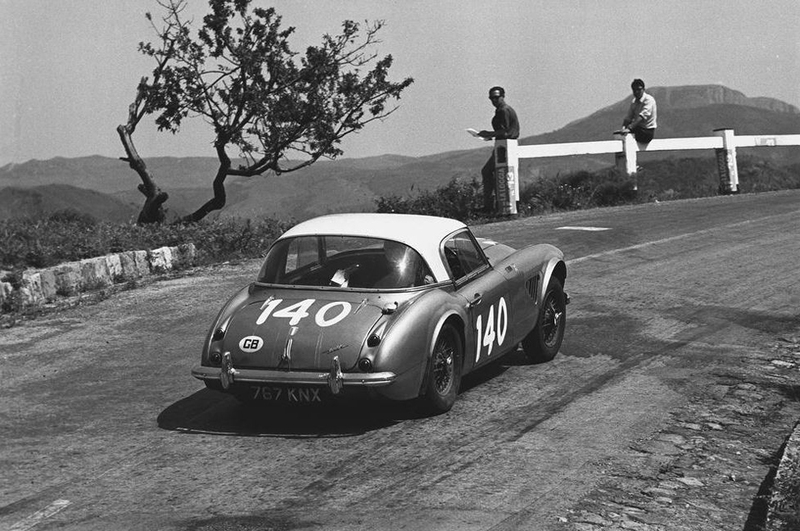 A sabbatical for 1967 due to Worswick racing a sister car, ARX 91B, resulted in 767 KNX next running in the 1968 Targa Florio, a more successful race for the Healey after Worswick and Richard Bond finished 29th overall and 4th in class. Throughout this time, Worswick raced several times at national level before putting 767 KNX into storage in 1970. Emerging from long term hibernation, Worswick entered 767 KNX for the 1982 Golden Fifty RAC Rally and finished 5th behind Paddy Hopkirk in the winning Mini and three other Minis. To reward his efforts he took the GT class spoils and the Team Prize. A return to circuit racing beckoned with a race at Oulton Park in 1984 followed by another adventure to Italy to compete in the 1987 Coppa D’Italia. Worswick’s adventures did not end there as he took part in the Anglo American Challenge as part of Team Healey, 767 KNX making its first visit back to the USA since the 1964 Sebring 12 Hours. Worswick finally sold 767 KNX after 26 years of ownership to Norman Grimshaw who historic raced the Healey throughout the Nineties with Barrie ‘Whizzo’ Williams. 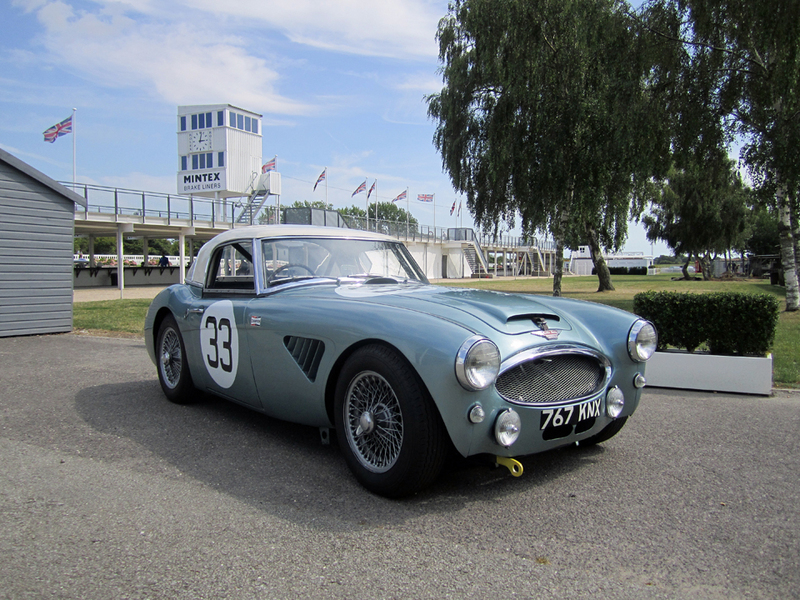 Grimshaw sold the Healey to Jonathan Procter in 2004 who immediately sent it to Denis Welch Motorsports for a complete mechanical rebuild. Following completion, 767 KNX was sold to a collector in Virginia, USA, who kept the Healey until 2013 when 767 KNX was brought back to England. Currently offered in highly original condition with a wonderful and authentic patina, 767 KNX has matching numbers and accompanied with a substantial history file and recently issued HTP papers. Recent work in the last six months has included a complete electrical re-wire and the fitment of a FIA compliant 6-point roll cage. At a recent Goodwood trackday, 767 KNX was given a gentle shakedown and was found to be fast, sure-footed and a joy to drive. 767 KNX is the perfect car for serious events such as Le Mans Classic and Tour Auto or the concours lawn (especially as an ex-Amelia Island entrant).